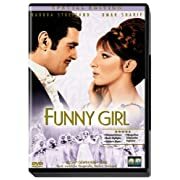 I watched Funny Girl starring Barbra Streisand, the other day. I ABSOLUTELY loved it! It was kinda long and certain scenes dragged on but for the most part I thoroughly enjoyed it. Barbra ALWAYS selects roles that portray her as ALL BRAINS, LITTLE BEAUTY. I think it's endearing and my mind works much the same way. When you get a free minute, you should go watch it. When I was growing up, I didn't feel like a beautiful child. Everyone ooh'd and ahhh'd at my cute, fat cheeks and my curly hair and that was the extent of that. Sure, I was a pretty smart girl with an extremely quick temper and I was quite athletic... could play the piano and still do so on occasion. The funny thing is that I'm truly grateful for all the talents I have and the wonderful brain that sits between my ears. I'm even grateful for the great, big, compassionate heart that beats in my chest HOWEVER I just want to be the girl that turns heads when I walk into a room. And they look and stare because of my beauty. In high school, I was a popular girl because I was all those things above... and I was a sweetheart and was a star athlete. That's all fine and dandy. Really! But I want folks to look at me and think -- "Wow! She's gorgeous!" And then when they get to know me, they'd whisper how graceful I am. 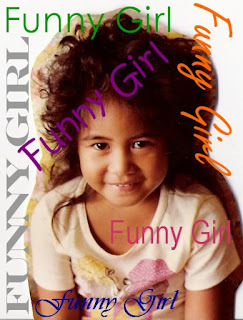 I'm tired of being fat, FUNNY GIRL. My mother has said some VERY hurtful things to me and continues to do so now. The one thing that she's always told me is, "You would be so pretty if you weren't so fat." The phrase haunts me. Here I am, halfway through my Thirty-First year and I'm still plagued by those hurtful words. My fathers brother had all the fat jokes in the world for me. Both grandmothers used to quip at how big I am. It seems that even with all the brains in the world and all the talents and the pleasant personality I possessed; with all my sports achievement, ultimately, the only thing anyone ever noticed was how fat I was. I've learned to dodge the fat jokes, laugh at them and even throw in a few of my own. As I write this, I realize more and more that I don't have to accept and adopt everyone's perception of me. Really, I should define myself and tell everyone who I am! However, I still revert back to that wounded fat child. I look in the mirror and wonder why everyone decided that I should be the nice, fat, FUNNY GIRL. I've allowed them to define me for wayyy too long. Who I am should be a reflection of what I see in the mirror and how I feel about myself. I DECIDE! I've been better in the last couple of years. I've really learned to LOVE the woman I've become. I am really comfortable in my own skin. I am a very eloquent, loving, old school kinda woman. The kinda woman that my husband couldn't wait to take home to his mama. I cherish that! I LOVE being the kind of woman that my husband can COMPLETELY rely on. I love being me -- with all my flaws and all my talents and am worthy of all the gifts I receive from the Creator. He made me in his own image. I should be so lucky!